Villa Stiassni is situated right in the centre of Brno in the quiet urban residential area of Pisárky, almost within earshot of the city-centre clamour. 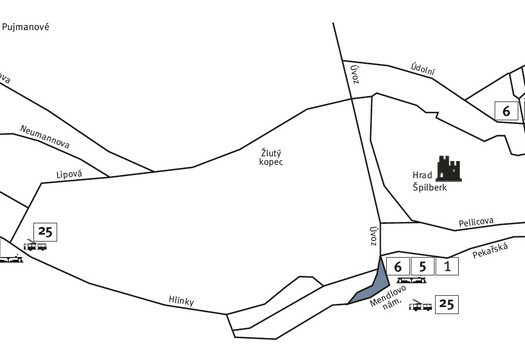 Although the grounds occupied by the villa are extensive, the site can only be accessed from Hroznová Street. You will find the ticket office right beside the road. Journey by public transport: we recommend using tram no. 1, or taking trolleybus no. 25 or 26; alight at the stop Pisárky and follow Hroznová Street up the hill for about 360 metres until you reach the entrance.